The guest list. The mere thought of it is enough to send many couples running for the migraine meds. Should we invite naughty Uncle Harry? What if he acts badly and hits on the bridesmaids? What about Ted from work? Sure, we don’t like the guy, but we were invited to his wedding. And then there are the two Tasmanian Devil children that just happen to be the boss’s spawn. Do we have to invite children? 1.Pay for your own wedding – or at least the majority of it. That way you will have more say in who doesn’t make the final cut. 2. Only invite your nearest and dearest. Moms, dads, sisters, brothers, grandmas, grandpas and close friends make the list; acquaintances and distant relatives don’t. Let them down gently. 2. Don’t invite co-workers – even if they invited you to their weddings. See #3. 5. Don’t allow dates. Serious boyfriends and girlfriends only. 6. Have a destination wedding. 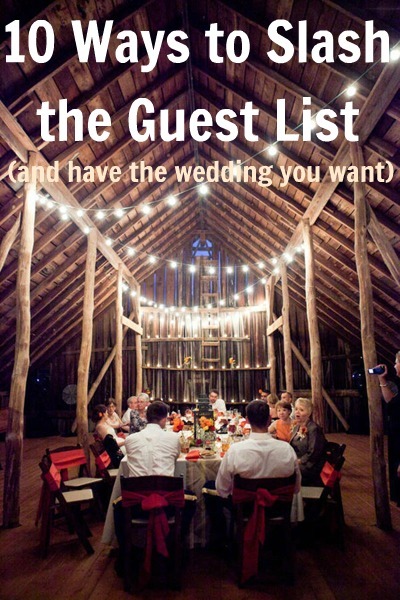 This is usually a surefire way to keep your guest list small – unless you hang with a well-heeled bunch. 7. Elope. (Paris anyone?) Make it just the two of you and maybe a couple of close friends or your parents. 8. Plan a post-wedding party so you can still celebrate with people who weren’t invited. This is a popular option for couples who go small. 9. Pick a small wedding venue. Size constraints can work wonders for a mounting guest list. 10. Read Ten Reasons to Have a Small Wedding. Then read Ten More Reasons to Have a Small Wedding. Please note that these are only suggestions. If you love kids, by all means have them at your wedding! If the thought of having your co-workers at your wedding makes you warm and fuzzy – go for it. Just remind yourself that it really is okay to have a small wedding, even if there are some hurt feelings along the way. Whatever you decide, it always goes a long way to be considerate to others. If people are upset that they aren’t invited, apologize and explain to them that you are having a small wedding and that you just can’t invite everyone. Some will get it; others won’t. Courage, my love! You won’t regret a thing by staying true to yourselves. But don’t just take it from me – let these couples convince ya.